Prophet Mohammed (peace be upon him). Sahih Muslim 1348. 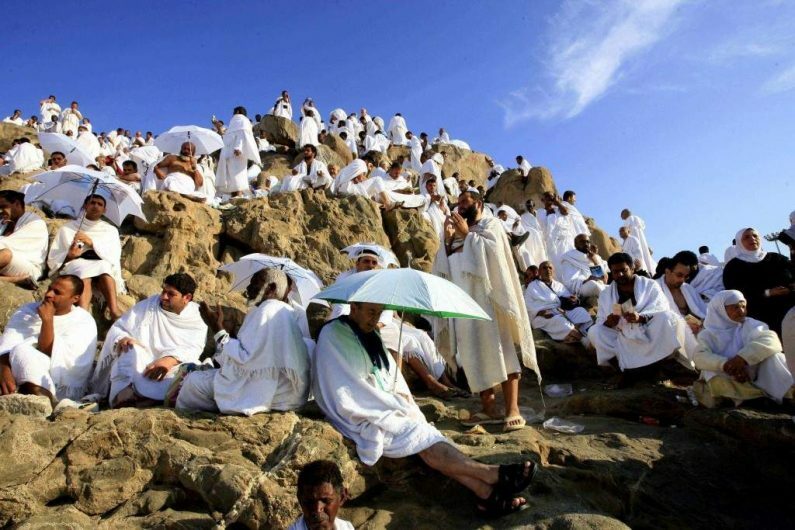 The Day of Arafat is the Day of Hajj. 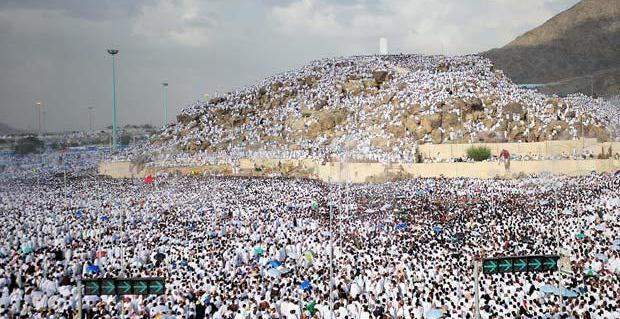 When Prophet Mohammed (peace be upon him) was standing in Arafat on a Friday, a Qur’anic verse was revealed to him, “This day I have perfected your religion for you, completed My favor upon you, and have chosen for you Islam as your religion.” This is from Surah al-Maidah (5:3). It is this day when the pilgrims gather in Arafat, praying and supplicating to their Lord because Arafat is a day of forgiveness from sins. This is the day that every pilgrim look forward to with great anticipation. Let’s put is this way: the entire hajj and its validity is confined in the actual day of Arafat. This means that Hajj becomes valid only when the day of Arafat is observed by those who undertake the journey. 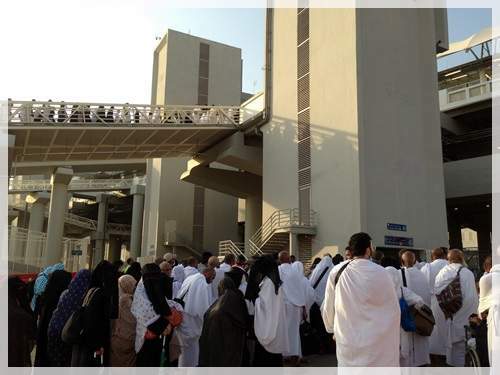 Regardless how long the pilgrims stay in Makkah, if they missed this day, they have then missed the whole Hajj. 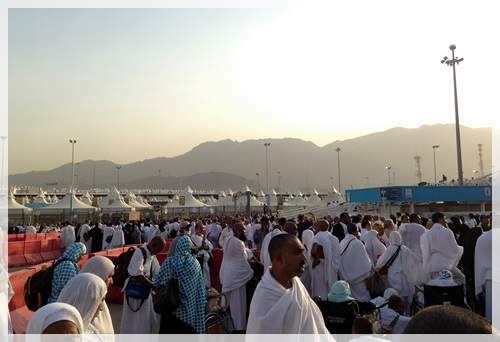 The intense excitement for Arafat was palpable within the tents of Mina. After a restless few hours of sleep during our first night in the Mina tent, I woke up at 3:00 AM and, finding most of the women still asleep, decided to head to the bathrooms to wash and make ablution for Fajr. While the prayers were to be offered at 4:30 AM, the bathroom queue was already long enough for me to catch another hour of sleep, if only sleeping whilst standing was possible. Almost two hours later, I was back in my tent. All the lights have been switched on. Everyone was awake at this point and there was a very busy buzz in all the tents as people were either praying or packing their belongings. Our group leader knocked on our door and announced that we need not bring all our belongings to Arafat and that the door will be locked and secured while we were away. Mom and I decided to leave our clothes behind. We packed our dua list/books, Qur’an, MP3 prayer with Islamic lectures, toiletries, umbrella, and a bottle of water. 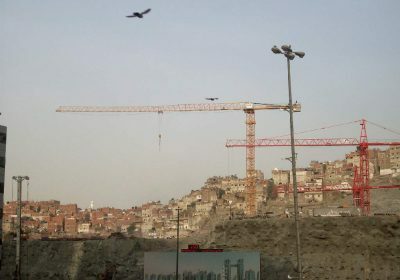 Makkah’s new Metro system is a great way to travel. It was a Friday. Our group assembled right outside the back gate of the UAE maktab. Our group leader was standing in front holding a big sign that has the name of our group on it, next to UAE’s flag. Stepping out of the gate that separated the UAE group of tents from the tents of other countries, felt like stepping into another world. 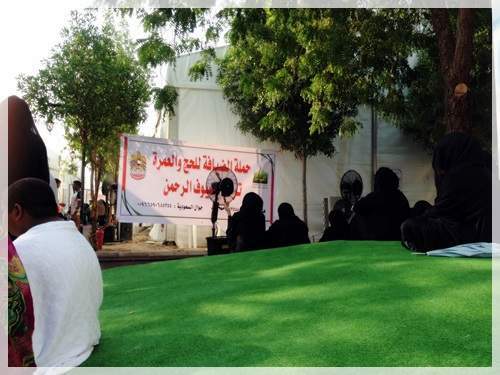 Right outside our comfortable tents with soft mattresses and endless supply of food and drinks, were hundreds of other pilgrims sitting on newspapers and cardboard boxes. Men, women, and their children sat there in the open with their belongings. I wondered why they were not in tents. 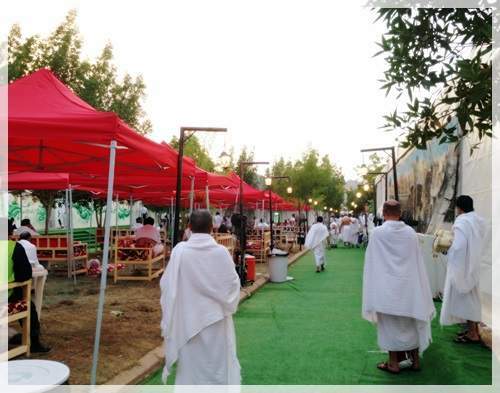 I mean, the Saudi government regulates the number of pilgrims each year, so I had always assumed that one of the reasons for this is for everyone to be accommodated comfortably in Mina. I felt Masood’s hand on my back, gently urging me to keep pace with the rest of the group. It’s almost 8 AM and there are pilgrims everywhere, all heading towards Arafat. The sun already felt hot, yet I’m too excited to be bothered by it. Our group leader kept looking back at us to make sure none of us went missing; he’d do a quick headcount every 15 minutes or so. Our group reached Metro Station # 2 and we were instructed to alight at Arafat 2. Several young men in uniform (both regular staff of the Metro as well as volunteer workers) were busy guiding the pilgrims where to go. Our group leader handed out Metro “bracelets” the other night, back in the Mina tent. These things fasten securely once you put them on and the only way to remove them is to cut them with scissors. I haven’t seen anyone sell these things during Hajj so I am assuming that our Hajj group has applied for these beforehand. Oh, and checkout my pretty abaya. It’s extremely light, cool to the skin, and dries very easily. Most of the women wore white, which became dirty even before reaching Arafat. And then there were those who wore black, and that seemed pretty hot under the sun and amidst the sea of pilgrims. The entire trip from Mina to Arafat takes about 2 hours by train and 6 hours by bus. As a matter of fact, the actual train ride itself took no more than 20 minutes but the long queues took forever. Still, traveling by train was a lot more convenient than taking the bus. Pilgrims who had to take the bus experienced horrible traffic conditions, exhaustion, and, ultimately, frustration. May Allah reward every single hardship faced by all hujjaj. We were separated from the rest of our group because mom was in a wheelchair and we were directed to use the elevator. So families with a wheelchair with them all gathered in front of the elevator. The problem was that there was only one elevator and everyone was in a rush. Inch by inch, we moved forward, closer to the doors of the elevator. By the time we were in front of the line, people started pushing us from behind. The second the doors opened, some of the pilgrims began behaving like crazy, shoving us violently inside the elevator so that they could also all fit in and not wait for the next trip. As I was unsuccessfully trying to keep a decent distance between myself and the gentleman in front of me, I felt a wheel almost crush my right foot. There was a huge commotion at the doors with the pilgrims refusing to move back and the staff desperately attempting to make space so that the automatic doors would close. By the time the doors did close—which, by the way, seemed quite a miraculous feat in itself—the elevator was filled so much there wasn’t an inch of empty space. Pilgrims were pressed against each other, all sweating and visibly shaken from all the pushing and shoving. The elevator quickly filled up with carbon monoxide and the odor of sweat, and before we all ended up fainting right then and there, the doors reopened, sending in fresh, cool air from outside. The next train arrived almost immediately. There was a separate queue for wheelchairs and disabled, so we were asked to line up there. Quite predictably, the moment the doors of the train opened, people disregarded the lines and proceeded to rush violently inside as if their lives depended on this particular train. Two gentlemen gave up their seats for me and mom. The train was very new, modern-looking, clean, cool, and spacious. Outside the huge glass windows of the train, I could see the entire city of Mina lay magnificently for us to admire. 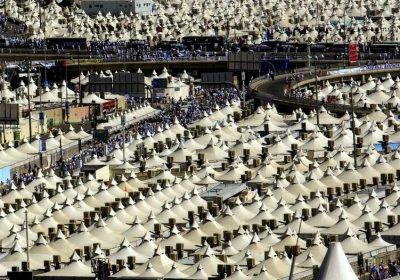 Rows upon rows of white tents as far as my eyes could see. For a few minutes, the massive number of pilgrims crammed inside the train and their voices faded away, and all I could see, hear, and breathe was the view of Mina. I was abruptly brought back to reality when someone stepped on my toe. I looked up and gave that lady a smile. She must have been exhausted. I got up and offered her my seat, which she promptly accepted. If you find yourself separated from your group and lost, approach a man in uniform. Army, policemen, and volunteers are trained to look after the hujjaj, and they can successfully guide you back to your group if you approach them – specially if you have your identification cards with you. I saw a few men and women—all of them older than 50 and unable to read directions/signs— who looked apprehensive as their nervous eyes scanned the crowd looking for someone familiar. One woman stood at the side of the road, obviously lost, but refused to talk to us. I wanted to offer her to use my cellphone, in case she wanted to talk to someone from her group. Down at the metro station of Arafat, we couldn’t find our group at the spot where they’d say they would meet us. Masood called our group leader, who told us to remain where we were and that he’d come get us. The crowd was thick in Arafat; every single pilgrim was here. Our group leader found us shortly, and he is accompanied by two other pilgrims from our group. We thought it extremely sweet and kind of them to come find us. They even helped push ammi’s wheelchair. We did lose our way once, having entered the wrong gate. The place can get so confusing! But when we did reach our tent in Arafat, I could not believe what I saw. When we hear the word Arafat, we immediately visualize a place that’s dry, dusty, hot, and crowded. But did you know there’s also luxury here? The footpath outside the gate was covered by straw mats and pieces of cardboard boxes. Families, even those with small babies, occupied these narrow spaces. A makeshift tent of plastic and more cardboard boxes protected them from the sun. Some families had portable stoves to whip up simple meals, others bought from street side vendors who took advantage of the crowd that the season of Hajj has brought in. Despite these difficult conditions, I had not seen nor had been approached by any pilgrim who begged for food or money. Even though their faces clearly showed exhaustion and lack of sleep, every single pilgrim held on, their faith giving them strength and contentment. My father and sister came to Hajj from Pakistan. They had taken a VIP package so that my father—whose body is taking a toll from diabetes, hypertension, and advancing age—could perform all the rituals comfortably. 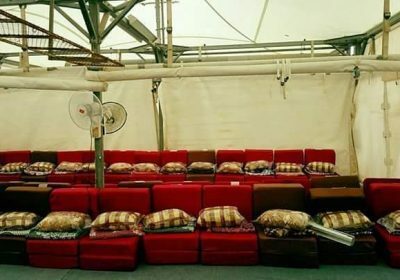 But while they did get to stay in five-star hotels in Makkah and Madinah, their tent in Arafat was the same as the majority of pilgrims: it was big and carpeted, yes, and they were provided with drinks and food, but the fan was blowing hot air within the tent. Lethargy and dehydration began to set in. Most of the pilgrims from their group developed severe headache, and my sister vomited twice. “Spending the day in Arafat was the toughest for me,” she would later tell me. I stood outside a wide gate, my umbrella shielding me from the harsh rays of the midday sun. A couple of security guys checked our IDs before letting us in. There were UAE flags everywhere. The first thing I noticed was stepping on a thick green carpet that looked and felt like grass. There was a covered area on the left in which chairs with comfortable cushions welcomed the pilgrims. There were large electric fans (that also blows cool mist) all over the place. Large dustbins made sure the place was always clean. Lamps illuminated the place at dusk. To our right was the men’s tent, and further inside were three more tents – two for the ladies and another one for the men. My mom and I walked into the ladies’ tent. I pulled up the flap of the tent and peered in. Cold air blew on my face. It took a few minutes for my eyes to get adjusted to the darker interior of the tent, considering that the sun was too bright outside. Each of the Emirati tent was huge. My tent was fully carpeted and so cold you couldn’t tell it was scorching hot outside. To my left were refrigerators with glass doors so that I could see that they were filled up with water, juice, soda, cups of yoghurt, chocolate bars, and bottles of buttermilk. There were tables filled with assorted snacks, baskets of fruits and fresh dates, and flasks of tea and coffee. The first few rows to my right were soft mattresses with pillows and blankets, all of which were occupied by women who were already sound asleep when I walked in. I wondered what time they arrived here. Just as my group was the last one to reach Mina, it was also the last one to reach in Arafat. All the mattresses and sofa beds were taken up, and we could hardly find a place for us to sit down. There were several trees inside our tent. Yes, real trees! Apparently, whoever organized these tents made sure there were trees around. And when I looked up, I saw crystal chandeliers. Too bad I couldn’t take a picture to show you because the women around me were unveiled. Mom and I walked toward the end of the tent and found a spot near a tree. My mom-in-law and sister-in-law also joined us. A few ladies from our group secured a couple of sofa beds and gestured for me to send my mom over to where they were. I asked my mom to go and get some rest. Masood called to check if we were okay. “I can’t believe the ladies are actually sleeping here!” I whispered on the phone. “How can you sleep on a sacred day like this?” He told me it was the same in the men’s tent. Pilgrims were tired. It was hot in the Mina tents and we did not get much sleep the other night. Once settled in, my sister-in-law and I got ourselves a fruit basket and some drinks. We then decided to go to the bathroom to freshen up and do ablutions to avoid the crowd later. There were four separate toilets and, next to them, was a wall with four taps attached to it for ablutions. On the other side of the toilets was a wall with sinks and mirrors. This entire area was then enclosed by a makeshift wall and huge white sheets to provide the women some privacy. One of the ladies bought a Dettol spray which was passed to whoever waited in line next. It was handed to me by the lady who went in before me, and I gave it to the lady who came next. I thought it was such a good gesture. The tap inside the toilet was broken and water was all over the place. 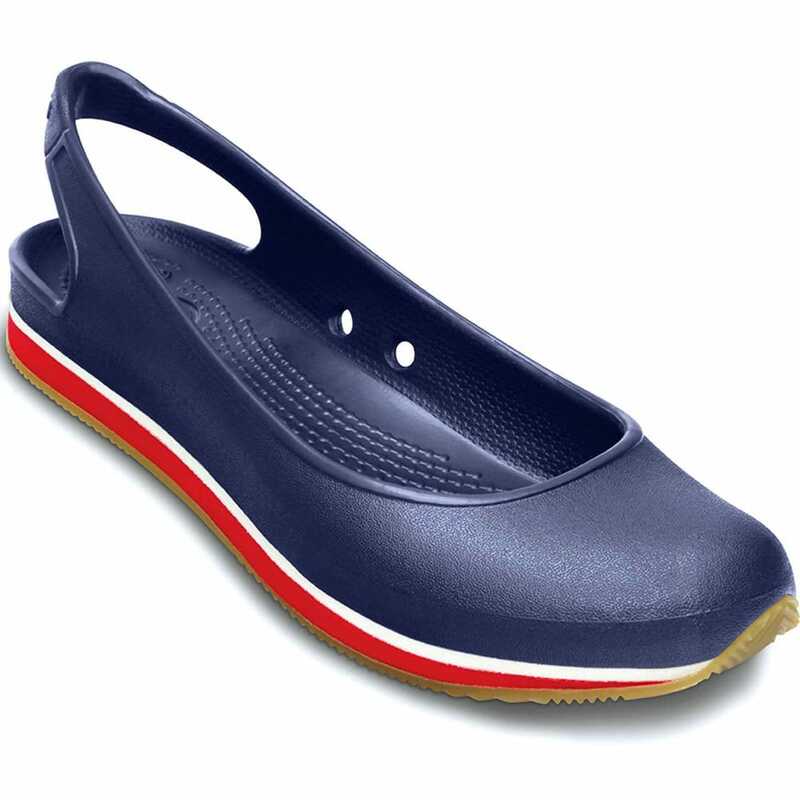 Again, I was glad I was wearing a washable pair of shoes from Crocs. While coming out of the bathroom, we heard what sounded like an explosion followed by women screaming. We rushed outside to see what was happening. Immediately, like a minute or so later, a fire truck and an ambulance arrived at the scene. Two women were carried out of the tent and into the ambulance. Later, we learned that there had been a short circuit in the tent, and the spark and noise scared the women. The ones closest to the air-conditioning unit that had the electrical malfunction got so scared they had to be calmed down by medics. The Friday sermon was inaudible through the speakers. Moments later, a lady rose and read from a paper that she held. It was about the importance and significance of the Day of Arafat. It was also about how we should be spending this day in order to gain maximum rewards from Allah. After her impressive sermon, we offered prayers. Lunch was served afterwards: chicken biryani, fresh salad, and yoghurt. We all sat together and had lunch as a huge group. I had a brief, friendly chitchat with a couple of ladies. A lot of women promptly went back to sleep after lunch. My family and I took out our dua list and books. We had so many dua requests from family and friends. We had so many duas to make for people we don’t personally know. We had so many duas for all the pilgrims. We had so many duas to make for ourselves. The Day of Arafat is the day to make duas. Every single moment is precious, and when I see my dua list and book, I realized that one day wasn’t enough. Masood called to tell me that he felt extremely sleepy inside the tent. He decided it best to go sit outside and read his duas there. “It’s hot out here, but at least I know I won’t fall asleep,” he told me. 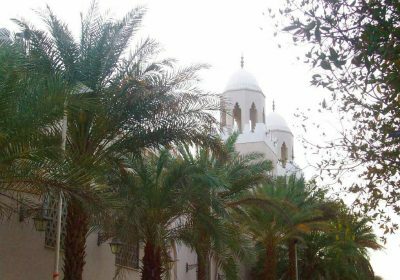 Everyone was awoken during Asar time, and pilgrims were urged to get out of the tents and make dua out in the open. It was quite sad to notice that some pilgrims had to be awaken from their deep slumber on a blessed day such as today. There were also those who preferred to chitchat in the coolness and comfort of the tent instead of going out and making dua. And then there were those of us whom Allah has blessed with an abundance of comfort and luxury, alhumdulillah. We sat under the shade of trees as fans with cool mist kept us comfortable. The sky above me was bright and blue, the thick clouds dulling the sun’s heat. I began my prayers by thanking my Creator for all the blessings I had been bestowed with. I imagined myself as a child and thought of all the privileges I had growing up, the education I had the chance to receive and complete, my family and friends, health, career, this Hajj, and so much more. Tears were pouring like they never flowed before. As I got lost in my prayers, I forgot about all the people around me. We were standing there, under the afternoon sky, our hands spread out, begging for forgiveness and imploring Allah blessings. More than anything else, each pilgrim would want to return home as pure and clean as a new-born baby. Each one of us beseeched Allah to grant us jannat-ul-firdaus. We prayed that we change as a person so that we are a better and improved version of ourselves when we return to our normal lives. We prayed for those who are living, and we sought forgiveness for those who have departed. Regardless of the state of comfort or discomfort one was in on the Day of Arafat, knowing that more than 2 million pilgrims were here in one place—leaving their families and possessions behind, and spending a fortune to be here as a sign of obedience to Allah—was a powerful feeling. When you’re out there in the open seeking forgiveness, you realize how small you are amidst this sea of people. You realize that being rich or poor does not matter in the end. You stand before Allah in Arafat with nothing on you except the basic necessities, and you know that when you die you will have much less than this. When it was time to leave we held each other’s hands, hugged, and cried some more. This time, they were tears of joy. Being able to perform hajj with one’s family is something most pilgrims are unable to do, mostly due to financial and health constraints. I looked at my family and immediately felt my heart fill with immense joy and gratitude. Our group assembled to leave. Lines were formed, and the leader did head counts to make sure nobody went missing. We were now heading to Muzdalifah to spend the night under the sky, and I couldn’t wait to experience this evening. 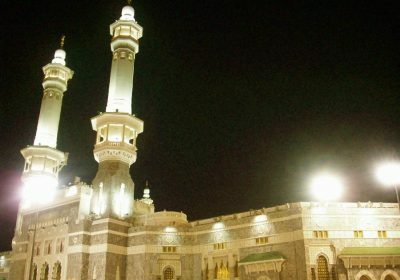 Getting to Muzdalifah and spending the night under the stars. Gathering pebbles for Jamarat, will there be enough for all of us? How does the six of us manage with only two sleeping bags? Nadia, I’m really enjoying reading about your experience, thank you for sharing your thoughts on the journey with us! I can’t wait to read the next one. Please update your blog soon. We miss you! Nadia Baji, JAZAKALLAH KHAIR FOR THIS! Wa iyyakum, Miss Maqsood! Are you still in Riyadh? I hope you are having a great time with your family. All of your parts on this “reflective” journey of Hajj were so thoughtfully penned down. The very last paragraph under this note however, brought tears to my eyes. Indeed, this is one of the sacred journeys of life where one seeks forgiveness from the almighty, reflect on his/her life and vow to change it for the better in the path of Allah (SWT). Jazak’Allah to you and Masood. Wa iyyakum, Behbood. I am so happy that these posts could convey my experiences and affect someone else in a good and positive way. May Allah grant the privilege of Hajj to all, specially to those who haven’t had the chance yet. And to all those who have been blessed to perform the Hajj, may Allah accept all deeds and prayers, forgive our sins, increase our imaan, and make us best examples for everyone. Ameen. I like the color of your abaya ,it is indeed pretty. Nice color. And I think it make sense to adhere to something that dries out quickly and doesn’t trap heat like black color . Cool choice. I would love to see your abayas and scarves may be in a different post sometime. And I too am waiting for your muzdalifa post. Thank you so much! These abayas are simple ones in which I added some lace on the sleeves to make it appear a little “girly” 😀 Normally here in the UAE, I wear simple black abaya with black scarves to work. Will get on writing the Muzdalifah post soon, insha’Allah. 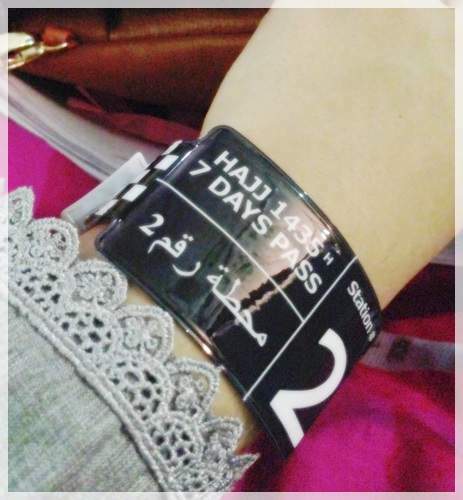 Jazakallah khair for taking me back to these priceless memories. I still can’t believe we have gone all through this wonderful experience. May Allah accept our efforts and Hajj and give chance to the most deserving people to do Hajj. Like Behbood said – I also had tears while reading the last paragraph, it’s so touching. I know, it does feel like it’s been ages ago, and at times it’s so surreal. Subhan’Allah. Ameen to your dua. You’ve done a great job organizing the entire trip of hajj for us and for our families (which was an extremely stressful and exhausting task, and at one point, taking everyone together seemed impossible), and you did an even better job taking care of us all during hajj. I keep telling you this in person and I’m telling you here as well: jazak’Allah khair for everything, and may Allah reward you for your efforts, your good deeds, and your love and dedication for your family. Ameen. Honestly, it’s so refreshing to hear of the Hajj experience from a woman and someone who went so recently. When we went on Umrah in Jan, I very much got a taster of Hajj! Subanallah, looking forward to reading more! Humaira recently posted..Spring Has Sprung! Haye Nadia, this all feels so magical. While reading, it feels like someone is pinching my heart continuously. 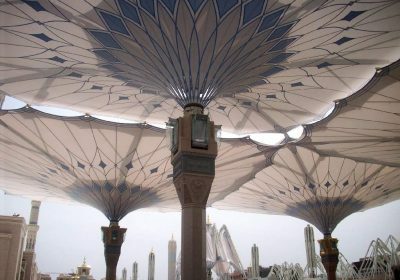 May Allah let us visit this awesome place too, Ameen. Beautiful description. Lala Rukh recently posted..Dead I am.